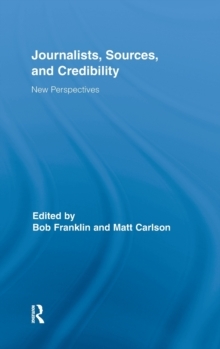 This volume revisits what we know about the relationship between journalists and their sources. By asking new questions, employing novel methodologies, and confronting sweeping changes to journalism and media, the contributors reinvigorate the conversation about who gets to speak through the news. It challenges established thinking about how journalists use sources, how sources influence journalists, and how these patterns relate to the power to represent the world to news audiences. Useful to both newcomers and scholars familiar with the topic, the chapters bring together leading journalism scholars from across the globe. Through a variety of methods, including surveys, interviews, content analysis, case studies and newsroom observations, the chapters shed light on attitudes and practices in the United States, United Kingdom, Germany, Australia, Sweden, Belgium and Israel. Special attention is paid to the changing context of newswork. Shrinking newsgathering resources coupled with a growth in public relations activities have altered the source-journalist dynamic in recent years. At the same time, the rise of networked digital technologies has altered the barriers between journalists and news consumers, leading to unique forms of news with different approaches to sourcing. As the media world continues to change, this volume offers a timely reevaluation of news sources.